Justin Daniel Smith, 31, of Thompson, PA and formerly of Warren, PA died May 31, 2012 as a result of injuries sustained in an automobile accident. He was born September 6, 1980 in Warren to Suzanne M. Nelson of Warren. He was a former resident of South Carolina and Las Vegas, NV. Justin had been employed as an assistant chef at Bridgeview Restaurant in Nicholson City, PA and previously worked at the Conewango Men’s Club as a chef and Jackson Valley Golf Club as a cook. He enjoyed skateboarding in his leisure. His family and friends were the center of his life. 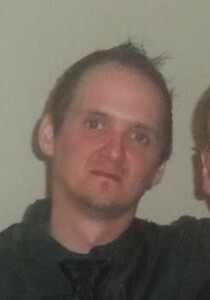 In addition to his mother, he is survived by his companion – Shawna Alleman of Thompson; one child – Kai Alexander Smith of Warren; one adopted child – Tristan Alleman of Thompson; A brother – Shawn Smith; A sister – Trinity Zock both of Warren; a maternal grandfather – Marion Care of Warren; and several aunts, uncles and cousins. His grandmother, Theresa Care, died five hours after Justin. Words cannot express how deeply saddened I was to hear about first Justin then your mom. I was always very fond of your mother, she was such a nice woman. And Justin, I remember when he was born. Such an adorable little boy. I saw a picture of his son on Facebook and thought for a moment it was a picture of Justin when he was little. He looks so much like him! I wanted to come to the memorial service, but we will be in Pittsburgh until Sunday. Know that you are all in my thoughts and in my heart during this sorrowful time. If there is anything I can do, please do not hesitate to call me. Love you all.